Well, finally we did it. We actually completed a Winter Mid-Range Prone match in 2016. We had only five (5) shooters, but as a group we enjoyed a nice spring day. You never needed gloves, and there wasn't really much wind. We installed three targets using the SMT system. Shooting two relays we completed two twenty shot matches by 10:36 after starting at 9:00. In general the electronic target system earned a payment on its cost this morning. 1) The targets represent a different distraction. A shooter is used to glancing into their spotting scope to see the location and value. The scope doesn't tell anything now. You have to glance at your "device". 2) You need a device that you can comfortably see. I tried a small one (8*) and a standard sized one. The standard sized won hands down. 3) You need to configure your device to avoid the screen saver from invoking during the string. It is inconvenient to have to unlock the device during a string. 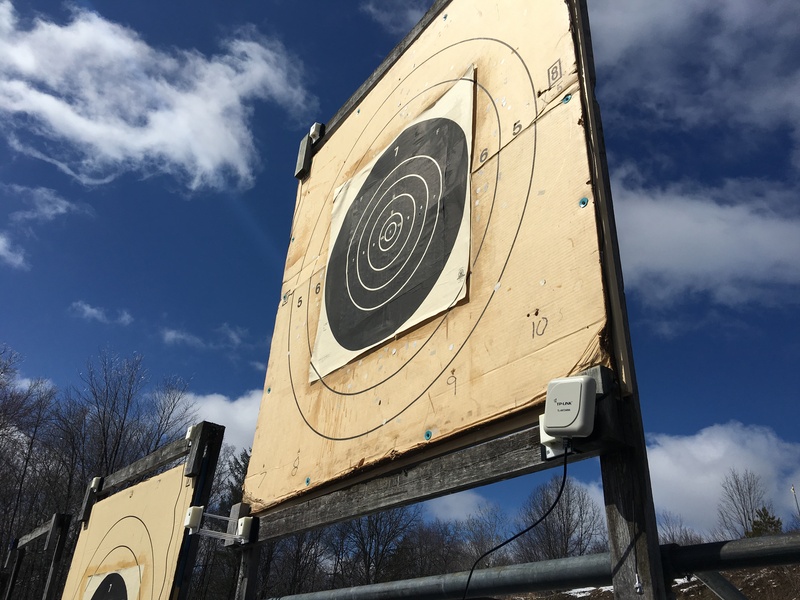 4) If you are planning to shoot the MWP, or the F-class nationals, SMT targets will be used. You need to learn how to deal with the device and the targets before you head to Lodi. 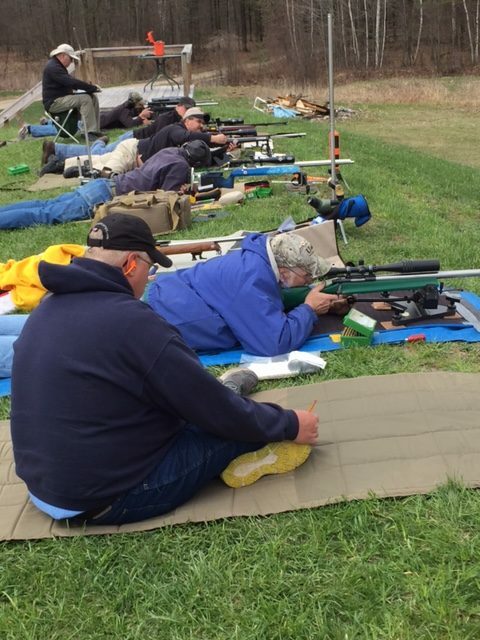 The 2016 Snow Country Shoot-Off was conducted on April 9, 2016 at the Jackson County Sportsman's Club in Jackson, Michigan. Mom Nature almost caused a reschedule. Northern Ohio had upwards of 10" of snow, Jackson had 3-5" of snow, and the rest of us had zero to a dusting. Make for a difficult ride. However, eight (8) of the ten (10) invitees made it, and we had a good match. We used Orion targets and machine scored. There were no challenges, everyone was scored equally tightly. Kevin Nevius won again with an 1192-86X. His victory was once again by a significant margin. The real contest was who would be second and third. The next three shooters were separated by one point and a few Xs. 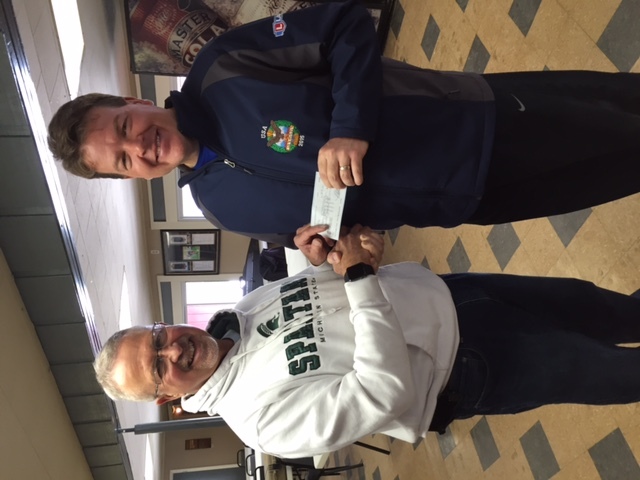 Leo Cebula presents Kevin Nevius the $100 check for winning the Snow Country Shoot=Off. Okay, we did do it. Maybe not terribly successfully, but we did do it. I guess that I should have been suspicious when I ran into the "white out" in Flint in I-75 while driving to the range. Maybe when it happened again on US 10 driving towards Midland. I think I should have taken the hint. Mother Nature doesn't like me, or the Winter Mid-Range, or the Midland County Sportsman's Club. However, we didn't take the hint. Didn't have a lot of shooters (they must have read the weather report better than I did). But we shot 2 F-classers, and 2 sling shooters. Neither of the F-classers did enough shots to report a score, but Jake Bondy nailed a 199 with sling, and I did a 148 for 15 shots with sling. We ultimately had only one target operational. We are coming to the conclusion that we are doing something wrong. Moreover, we had a tough time trying theories due to several "white-outs", where we could not see the targets. Jake Bondy and Charley Hayes waiting to shoot. A snow covered Bob Lorenz. A snow covered Jake Bondy. Charley Hayes shooting in the snow. Charley picking up his gear as the snow falls.